This is a gem of a book...The chapters on the diagnosis and definition of psychiatric disorder, interpretation of toxicology...and road traffic law...are alone worth the cost of the book. 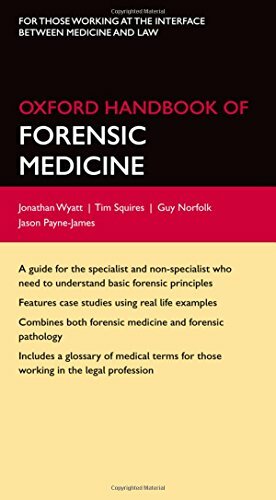 This brilliant book is a must-have for any practitioner who requires quick reference to forensic medicine. Having trained in Emergency Medicine, Jonathan Wyatt undertook two years of research in Forensic Medicine which resulted in an MD from the University of Edinburgh. Jonathan has undertaken clinical forensic work both in Scotland and England since 1996 and provides expert forensic opinions. He works as a consultant in Emergency Medicine in Cornwall and has a strong academic interest, with more than 100 publications in peer reviewed journals. Dr Guy Norfolk was the founding President of the Faculty of Forensic and Legal Medicine of the Royal College of Physicians of London and is Consultant Forensic Physician to Avon and Somerset Constabulary. He chaired the Education and Research Committee of the Association of Forensic Physicians and was the former forensic medical advisor to the Police Complaints Authority. He is a member of the Editorial Board of the Journal of Forensic and Legal Medicine and he lectures frequently at induction and development training courses for forensic physicians. In addition to publishing various articles in the field of clinical forensic medicine he has also contributed eight chapters to textbooks on related topics. Jason Payne-James LLM MSc FRCS FFFLM FFSSoc DFM RNutr: Consultant Forensic Physician; Director of Forensic Healthcare Services Ltd; Honorary Senior Lecturer, Cameron Forensic Medical Sciences, Barts & the London School of Medicine; external Consultant to the National Injuries Database and other agencies; Editor of the Journal of Forensic & Legal Medicine. Research interests include detainee health, death, harm and near-misses in custody , torture, drug and alcohol misuse, sexual assault, non-accidental injury, restraint and use of force, age estimation. Is co-editor or co-author of books including the Encyclopedia of Forensic & Legal Medicine; Forensic Medicine: Clinical & Pathological Aspects; Symptoms and Signs of Substance Misuse; Artificial Nutrition Support in Clinical Practice; Dr Apple's Symptoms Encyclopaedia; Medicolegal Essentials of Healthcare.